Hi all! So I’m trying to get past the psychological barrier of backpacking in the desert with a tent vs a tarp. Ive gone with a tarp/bug net set up, but I feel like the bug net was added weight that was there for peace of mind. I’m always a little weirded out by the idea of waking up to some snake/spider/millipede etc hangin our in my sleeping bag for the night. Does anyone know of that ever happening? Is that even a real risk, or is the bug net providing me with some real risk protection? I've "cowboy camped" many times and have never had anything like that occur. I have cowboy camped 100's of nights and nothing has ever tried to get into my bag or bother me. One of the best things about hiking in the desert is that you rarely need a tent. I hiked the Cross Canyon trail in April 2017. There wasn't a cloud in the sky when I began the hike and I was going to leave my tent behind. Luckily, for whatever reason, I brought it with me. That night there were thunderstorms all night. All the lightning was in the distance, so I was safe. But it poured most of the night and I would have been miserable without a tent. 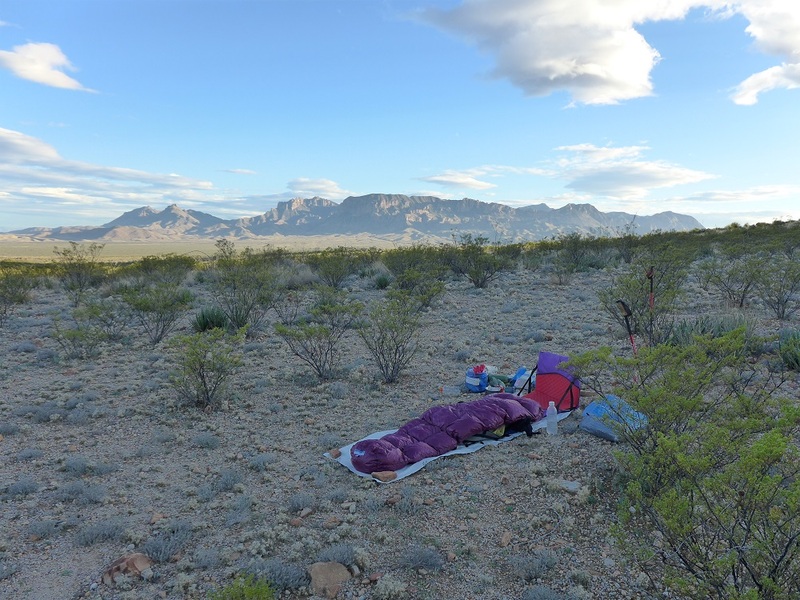 That being said, I have hiked many times in Big Bend without a tent and was glad to save the weight. I hate sleeping with anything between me and the sky, but I ALWAYS take a shelter just in case. For the last twenty years or so, my preferred option has been my floorless tarptent. It’s an Integral Designs Silshelter: 100% waterproof, 0% bugproof, but I’ve never, ever had a problem with bugs or any other critter. The Silshelter weighs 10oz., plus 3-4oz for stakes. It uses one or two trekking poles to hold it up. And it’s stormworthy. Unfortunately, it’s no longer made, but Six Moons Designs makes something similar and possibly even better: the Deschutes. I've camped many, many nights in the desert and the mountains with no tent and no creature surprises. I do two things 1) use a ground sheet about 6" larger than my bag which gives a bit of a buffer zone and a sand/dirt free place to step if needed, and 2) use a waterproof/breathable bivy bag as an overbag which adds warmth and weather protection. I think i've only zipped up the top covering my head once or twice in my life. And I'm old, so that's a long time. I rarely bring a tent unless I am expecting weather, and often then I'll just bring a light-weight tarp. Though I have been sniffed out by coyotes in the middle of the night, the only negative interactions I have had were the result of me not be diligent and attracting mice. Waking up to the stars is the best cure for insomnia! Seen this question and read numerous comments on "cowboy camping". Last trip I did it. Although only car camping, instead of pitching the tent (which was in the truck) I threw my tarp and bag in the bed of the truck and slept there. Loved waking up and seeing the stars. Next night I went a step farther and threw it on the ground and slept comfortably. Got past the psychological comfort that some thin wall of canvas provides. Everyone either says "I have always slept under the stars in the desert" or they're at least referring to the Big Bend area. Also, usually in the winter months. What about wooded areas? Summer time camping in the Hill Country? I look under my ground tarp when camping there and find all sorts of bugs and roly polys and spiders. What about wooded areas? Summer time camping in the Hill Country? I live in the hill country but don't camp here in the summer. I really dislike humid conditions, esp when camping. And ticks. Sometimes in the Rockies at altitude i'll have mosquitoes; I've worn one of those bug net things that you wear on your head with success. But i usually sleep away from water if I can. I prefer sleeping on big flat rocks, actually, if available. Like austin gorpchomper I rarely go out in the warm months but do occasionally here in North Carolina and still just use a bivy sack and a tarp and have not had any problems with ticks or other critters but yes ticks would be the issue. I cowboy camp everywhere, any time, all year. Except when out with my family or inexperienced friends. Only my 13-year-old son is willing to sleep under the stars, everyone else needs a nylon or mesh roof at the end of the evening. As previously mentioned, I ALWAYS bring my 10oz Silshelter tarptent with 3-4oz of stakes. 14oz of never having to worry about the forecast is worth it to me. I also carry an essentially weightless mesh headnet in places where mosquitoes and other winged biters might be a problem. Used it many times in very buggy places and it works. As for creepy crawlies, they just don’t bother me or worry me. I suppose some day I’ll roll over onto a a scorpion in the middle of the night, get stung, and will then change my mind. You do have to be mindful of ticks in appropriate habitat. They’ll go straight for you. Best response if you’re in serious tick territory is daily full-body self-inspection. It takes most ticks many hours to infect you with whatever they might be carrying. Now, chiggers....well, not much to be done about them, in or out of a tent. Two Septembers ago, I took a friend to the Wichita Mountains Wildlife Refuge on his first ever backpacking trip. We used a brand new REI Half Dome tent and I still came away with well over a hundred chigger bites. The aftermath was bloody miserable. I hate chiggers.